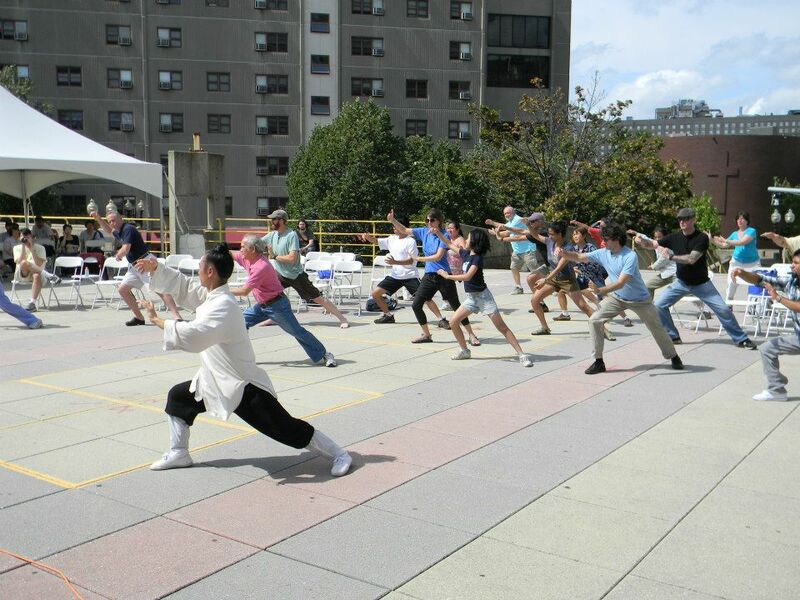 A lot, (but not all) of my involvement in Chinatown centers around Kung Fu and Martial arts, so the more I explore Chinatown’s history, I always learn something knew about the history of Kung Fu in Chinatown. It is interesting to me that many of the things that I though I went through, had happened already decades ago for others. Posting about Kung Fu has put me in touch with fantastic masters like Sifu Edward Woodruff and Sifu Tim Lavallee. It also helped me get closer to other Masters like Sifu Donald Wong and Larry Wong. They have many stories about OLD Chinatown and are instrumental in developing new Chinatown. And of course Sifu/Director/film star Mandy Chan. Many more reach out to me who are not as public. I had the opportunity to shake hands and connect at the Films at the gate event. The following interview was done through a document. His wife translated the questions. I was born in Henan Province, in central China. When I was 13 year old my parents sent me to Wudang Mountain, which is a sacred Daoist (Taoist) mountain. I lived and trained full time in a martial arts academy there. 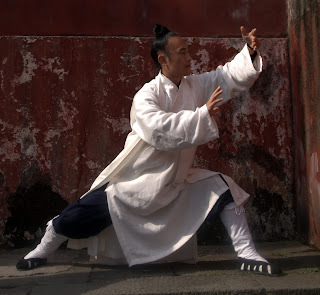 When I was 17 year old, I left the academy and entered the temple and became a Daoist priest. Read more about Zhou Xuan Yun's training here. My wife is from Boston. We met in China and moved here in 2009, after our daughter was born. How was it initially coming into the Boston Chinatown Community? When I first came to Chinatown, my first impression was that it was dirty, but that the food was good. I also was surprised that Southern Chinese culture was so prevalent. It is wonderful that there is a Chinese community in Boston, but Boston Chinatown does not represent the diversity that can be found in China. What did you observe about the other Martial Artists. Before I moved to Boston, I came here once for a short visit. During that visit I happened to meet Yang Jwing-Ming (from Yang’s Martial Arts Association). I felt his ideas about the martial arts were very good. I published three DVDs through YMAA Publications, and taught seminars at his former school near Forest Hills. When we moved to Boston, I got to know the Chinatown community better. I was pleasantly surprised to see that there were a lot of traditional Chinese arts being practiced. Of course, the martial arts community here is not perfect. One of the problems is that a lot of the masters are much older. There isn’t a lot of energy or vitality in the martial arts scene. Also, most people are interested in promoting their own style or lineage. There isn’t a lot of cooperation. Many newer forms of martial arts (like MMA) are drawing potential students in a different directions. Chinatown rents are also rising rapidly, and martial arts schools have been forced to move elsewhere. It is difficult in this country to be a professional martial arts teacher. The vast majority of teachers have a day job and teach martial arts as a hobby, even when it is their true passion. The traditional martial arts are at risk. How did having a child change things? As a Kung Fu Parent myself, I found your approach with your daughter learning gymnastics interesting. I think other Sifus like Mai Du can relate to having your child learn from someone else instead. When teaching kids, your class has to be a mix of training and play. My teaching style is more old-school. For example, I don’t have a ranking system, and I don’t teach a kids-only class. I have a few children in my classes, but most are adults. Most of my students had trained and taught martial arts for many years. They were frustrated and looking for a way to bring their practice to the next level. In many ways, my daugher is a typical American kid. She thinks that training kung fu is too boring. Gymnastics is a great way for her to gain flexibility and strength while having fun with other kids her age. It will also make it easier for her to pick up martial arts in the future if she wants to. What do you think about the future of Chinatown and how has your involvement with the community shaped your view? I think that Chinatown is becoming more and more commercial. Service industries like stores and restaurants will succeed, but there will be less and less room for cultural or educational institutions. People visiting Chinatown will have less places they can go to understand Chinese culture on a deeper level. The things that you and I teach are art forms, not commodities. They take years of hard work to learn. Martial arts can’t be put in a to-go container, but for dedicated students, they can be life-changing. Why do you think there isn't as much outdoor stuff in Chinatown? From what I’ve seen, outdoor events in Chinatown don’t make a profit. Every year my non-profit organization, the Daoist Benevolent Association, runs an event for World Tai Chi Day. The event is possible because of our volunteers and because of donations we receive. The event is worthwhile, but is it not profitable. Chinatown’s other large outdoor event, the Films at the Gate, is also run by a non-profit organization. I don’t see for-profit companies running outdoor events outdoors in Chinatown. Can you talk more about your Taoist beliefs? How do you balance those beliefs and that philosophy while being in Chinatown as opposed to being at a Temple. There is a saying in Chinese: 坐为庙，起为云. The first part of the saying means that anywhere you can sit can be your temple. The second part means that anywhere go, you can be free. Do you do any of the other stereotypical Taoist Priest things? Feng Shui, exorcisms, fortune telling, that sort of thing. 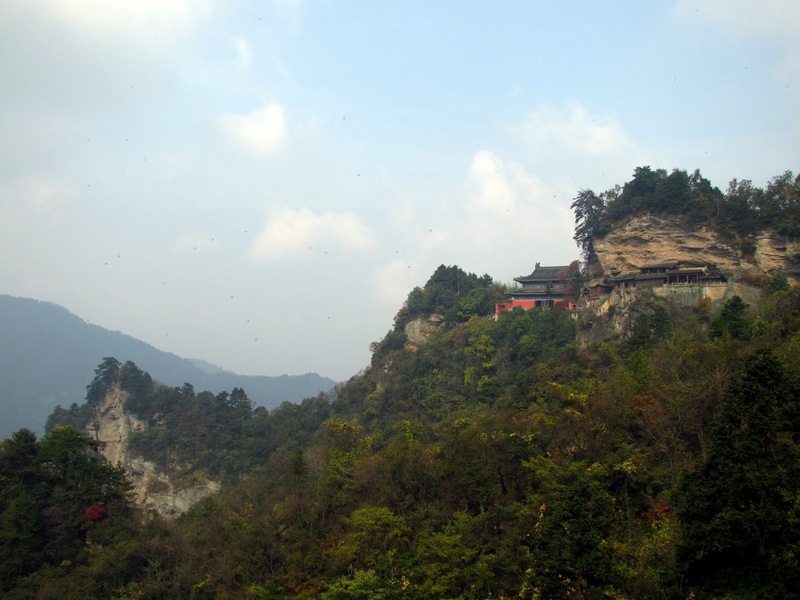 In the temple on Wudang Mountain, I was training in all of the Daoist arts, including chanting, ritual, divination, meditation, exorcism, and feng shui. I also lived as a wandering monk for over 7 years. During that time, I was able to seek out and study under new masters. I have continued with this work in the United States. I have officiated at weddings, and performed the traditional Daoist blessing rituals for new businesses, homes, and babies. I have also helped remove bad spirits from homes. 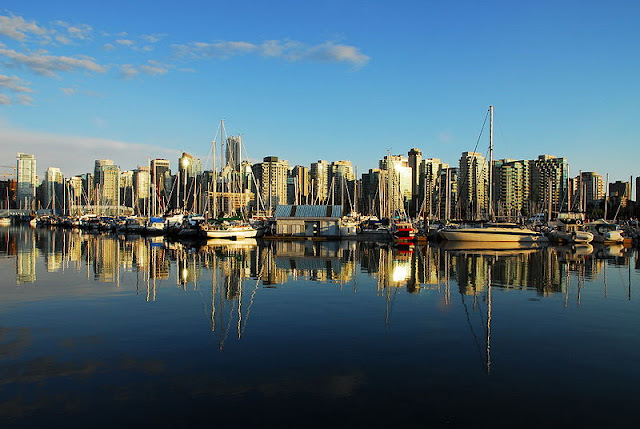 I have traveled with people to view homes or land they were considering buying. This isn’t something I advertise. I just wait until people find me. If it is meant to be, it will happen.